It’s been a harrowing week in the United States, with Donald J. Trump quickly proving he'll be no less polarizing a President than he was a candidate. Chief among his early accomplishments was the introduction of the term "alternative facts," coined by Presidential Counselor Kellyane Conway to explain a number of falsehoods told by Press Secretary Sean Spicer in his first briefing room appearance. So far, US brands have stayed mostly on the sidelines, terrified of becoming a target for Trump’s critics or supporters—or the President with the itchy Twitter finger himself. But in the UK, one brand and its agency acted quickly to capitalize on the uproar. Unilever's Dove and WPP's Ogilvy, a creative team with a history of igniting cultural debate, produced a two-page ad that appeared in the Guardian and the Times of London on Saturday that made clever use of Conway’s clumsy euphemism. The ads consist of a mostly white backgroud with a few spare typewritten sentences. 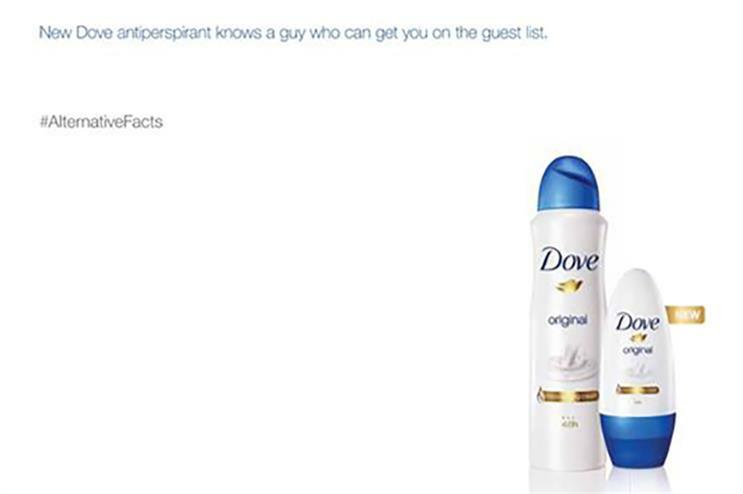 On the left-hand page, the copy is comprised of blatantly false claims about the new Dove antipersperant. "New Dove antiperspirant increases your IQ by 40 points." "New Dove antiperspirant was first used by Cleopatra." "New Dove antiperspirant can plan your next holiday at a competitive rate." And on and on. At the bottom of the page is a hashtag,"#AlternativeFacts," across from a shot of the product. 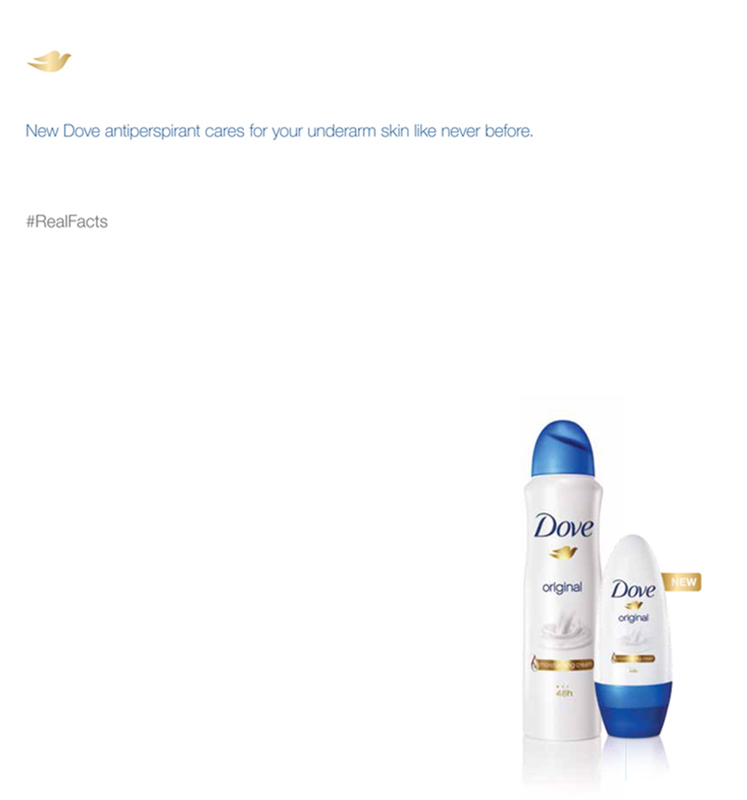 The right-hand page consists of a single typewritten line, "New Dove antiperspirant cares for your underarm skin like never before," above another hashtag, "#RealFacts." Though the ad makes no mention of Trump or Conway, it clearly takes a critical jab at the new adminstration by associating Conway’s term with ridiculous falsehoods. With tensions running high in the US, such a direct prod at the new President runs the risk of inciting a backlash. Before Trump took office, his supporters called for a boycott of Kellogg’s for removing its advertising from alt-right news site Breitbart.com (whose former editor is now a top White House strategist). Likewise, anti-Trump forces took aim at L.L. Bean when Trump tweeted a thank you to the brand for supporting him—even though it was the founder's grandaughter, not the brand itself, that had contributed to his foundation. But Tham Khai Meng, Ogilvy & Mather Worldwide Chief Creative Officer and Co-Chairman, said Dove showed little hesitation to move forward with the ad once it was presented by the UK office. "Brands live in a world of accountability. And that's a good thing," said Tham in an email message. "To see one respond so swiftly with an #AlternativeFact moment, done gently and with a smile, reminds us of that." Though the print ads are not planned to run in the US anytime soon, Dove will soon unveil a social media version of the work that will be visible to audiences everywhere. Even though the ad is not yet available digitally, it received some early adoration from the industry on Twitter. Metal Potential, a Tumblr site that predicts which workis likely to win Cannes Lions, posted an image of part of the ad on Saturday. Rob Schwartz, CEO of TBWA\Chiat\Day New York, added his compliments in an early morning tweet.